Today’s devotion is adapted from a recent post on Pastor Greg’s blog. To read his latest blog entry, click here. Scripture identifies six specific sins that can be committed against the Holy Spirit. Today, allow me to focus on one that can be committed by believers—grieving the Holy Spirit. To “grieve” means to make sad or sorrowful. It means to cause sorrow, pain, or distress. But what is it that makes the Holy Spirit sad or sorrowful? 1. Foul and abusive language makes the Holy Spirit sad. Verse 29 says, “Don’t use foul or abusive language.” The word used here speaks of something that has gone “rotten.” This includes obscene Language, profanity, dirty stories, vulgarity, double entendres, etc. Guess what? You are not to speak this way, privately or publicly. How about being “authentically godly”? 2. Bitterness makes the Holy Spirit sad and sorrowful. Some people just “like” to be mad. They live for conflict, arguing, and fighting. This, as with all sin, only gets worse if left unchecked and unrepented of. The sad thing is that bitter people rarely want to keep it to themselves. Instead, they spread it around. The Bible speaks of “a root of bitterness defiling many” (see Hebrews 12:15). I have a better idea–forgive! Copyright © 2009 by Harvest Ministries. All rights reserved. 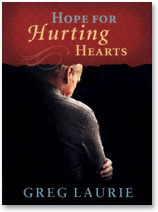 Hope for Hurting Hearts, Pastor Greg Laurie’s new book, examines these truths, revealing God’s love and care for us, and shows how we can find hope, even in the midst of the most unbearable pain and sorrow.